There is a famous saying by Chairman Mao: “If you don’t get to the Great Wall you’re not a good man.” As an ”Eighth Wonder of the Ancient World”, the Great Wall of China is a must-see attraction. However, there are many different sections of the Great Wall in Beijing, so which section is best for you? For the first-time visitor to Beijing, who wants to see most highlights of the Great Wall in a time-saving manner, without too much exertion, the Great Wall at Mutianyu is probably the best choice. Hike up the best fully-restored Great Wall section at Mutianyu. Enjoy a peaceful time and being amazed by the Great Wall at Mutianyu which is less crowded, has better architecture, and has more watchtowers than other sections. Take a cable car (or toboggan) up and down the mountain, avoid hiking up and walking back down the mountain on over 800 steps by taking a cable car or a toboggan, making it very easy to visit. With the greens of pines and cypresses covering ninety percent of the surrounding area, the scenery there is beautiful all year round. 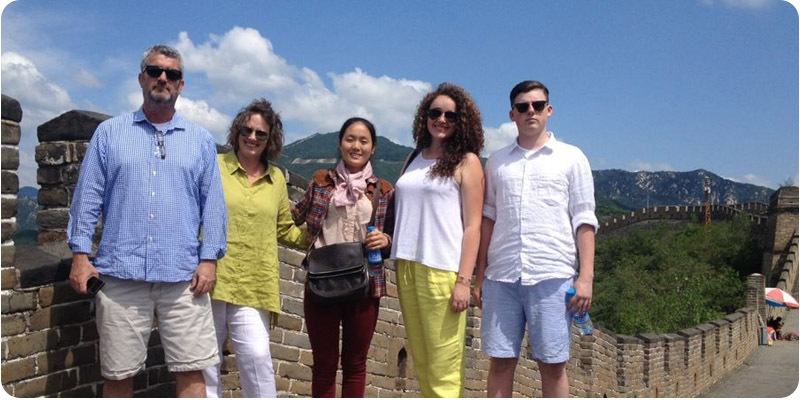 A unique Great Wall hiking experience escorted by a professional expert guide. Get free drinking water and hiking equipment at the Mr orange Refreshments Kiosk at the foot of the Great Wall at Mutianyu. Meet your guide at your hotel. He or she will be waiting in the hotel lobby, holding a placard with your name on it. Then drive to the Great Wall section at Mutianyu which will take about 1½ hours and we’ll have a rest and enjoy your delicious Beijing local food for lunch at our well selected local restaurant – Xinshuangquan. The evening before your tour, your Mr orange guide will call you at around 7:00 pm to confirm the departure time. If you don’t answer, your guide will leave a message for you at the front desk. If you’ve neither received a message nor a call after 8:00pm, contact the Mr orange Beijing Office on 13910694045. We will solve your problems on the spot. Be prepared for a hiking day and have a nice lunch before leaving. Do not forget you are going to the mountains where the weather can rapidly change, and that there are no shops on this part of the Wall. We are also available to provide the private airport transfer service for this trip, price from 18 USD p/p. Click here to book the transfer. We can drive our own vehicle to the foot of the Great Wall to save your precious time if we have lunch at the Subway™ while others have to wait for the public transfer bus to the foot of the Great Wall. Your guide will be waiting for you in your hotel lobby. Upon arrival, collect some cool drinking water and a walking pole at the Mr orange Refreshment Kiosk at the foot of the Great Wall before taking a shuttle bus to the Mutianyu tourist area. You will have three options for travelling up to the Wall: cable car, chair lift, or by foot. You can decide which option you prefer when you arrive. If you choose to go by cable car or the chair lift it will take seven minutes to reach the top of the Wall; going up by foot might take you 45 minutes to conquer the 300 steps, but you can walk in the shade of the trees and breathe the fresh mountain air which will also be enjoyable. When you arrive at the Great Wall, you can stretch your legs and take a relaxing walk on the Wall for three hours. We avoid (the worst of the) crowds on the Great Wall and traffic jams by visiting in the afternoon. Take a cable car (or toboggan) up and down the mountain, making it very easy to visit. Hike the Great Wall at Mutianyu. Arrive at the foot of the Great Wall and take a shuttle bus to the parking lot. You will be transferred back to your hotel at approximately 6:00 pm. If you plan to leave Beijing after your day tour, please check out from your hotel before departure. Normally it will take 10 to 20 minutes for hotel staff to complete the procedure. You may leave your luggage in our vehicle, and you will be transferred to the airport or train station straight after the tour to make best use of your time. You will need 1 hour to be transferred from the city center to airport, and you will need to be at the airport 1.5 hours before a domestic flight, or 2.5 hours before you’re an international flight. Tell us about your departure time when booking, and remind our guide, and we will make arrangements accordingly. We provide private airport / train station to transfer (price from 18 USD p/p). You don’t need to prepare trekking poles, water, hip bag, GPS, first aid kit, or walkie-talkie, because we will provide them FREE OF CHARGE. No Shopping! No Hidden Costs! Great Value for Money! We promise that there’s absolutely no shopping, no factories, no time-wasting itineraries while most other travel agents do to make the tour price seems to be lower. We are the first China travel agency to offer NO SHOPPING on all our tour itineraries.We might not be the cheapest one but we make all our efforts to make sure the great experience for our customers to create more value for our customers. excellent service provided by Mr orange tour guide.